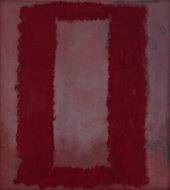 For his 1950s and 1960s Seagram and Harvard murals, American artist Mark Rothko employed lithol red – a highly fugitive pigment that is more commonly associated with the printing industry than artists’ paints. Some of the murals have faded, which has significant consequences for our appreciation of Rothko’s work today. This paper discusses the chemistry, manufacture, availability and end-use of lithol red in order to gain a greater understanding of how Rothko might have viewed the pigment. The mid twentieth century represented a time of great experimentation for artists, in terms of both materials and techniques. In their search for means with which to express new ideas, artists chose from an increasingly vast array of materials that might never have been intended for artistic purposes with unexpected consequences for the longevity of their works. One such example is Mark Rothko’s use of the fugitive pigment, lithol red (Pigment Red 49) in the 1950s and 1960s. Rothko’s use of this pigment has been widely reported in existing literature on the artist.1 Lithol red has been identified in Rothko’s Seagram murals of 1958–9,2 and in his murals at Harvard painted in 1962.3 Both series were executed in a palette of deep reds, blacks, and maroons. The Harvard murals were intended for the penthouse dining room at Harvard University, where they hung until the late 1970s. Exposure to high levels of light led to dramatic fading, and they were removed from display in 1979. There is also evidence of fading on Tate’s Seagram murals, although to a much lesser degree.4 The fading of both these murals has been attributed to Rothko’s choice of the highly fugitive pigment, lithol red. Lithol red is an azo pigment8 that comprises a family of sodium (PR 49), barium (PR 49:1), calcium (PR 49:2), and strontium (PR 49:3) salts of diazotised Tobias (2-naphthylamine-1-sulfonic) acid coupled with 2-naphthol. The metal dictates the shade of the pigment, which ranges from yellow to purplish blue: these types are described in Table 1 below. Lithol red was discovered in the late nineteenth century by an Austrian chemist, Paul Julius, who was working for the German company BASF. In an attempt to produce a new azo dye, Julius manipulated a cotton cloth impregnated with ß-naphthol and diazotised Tobias acid. Julius was reportedly initially disappointed with his discovery because the new colour exhibited poor affinity for cotton fibres, but further work convinced him that it had potential as a pigment.9 He applied for a patent, which was granted in 1899. Unlike most other synthetic dyes, lithol red was indeed suitable as a pigment,10 and it was one of the earliest colourants developed specifically for this application.11 It was widely available by the early 1920s. As a group, the azo dyestuffs are among the brightest and strongest yellow, orange and red pigments, which accounted for their popularity in a number of applications. 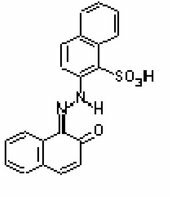 The Na type (PR 49) is not in fact a pigment, but a soluble dye. It thus has a tendency to bleed in water, which limits its usefulness. However, it is the starting point for the other types: in order to convert the soluble dye into an insoluble pigment, a simple ion-exchange process – whereby Ba, Ca or Sr ions replace the Na ions – is carried out. This process is inefficient, and a large amount of Na is left. Therefore, Na is always present in all the PR 49 types. With the exception of water-based printing inks, which must comprise the Ba salt,12 the choice of metal salt is purely an aesthetic one: there is no difference in application properties between the Ca, Ba and Sr types. As outlined in Table 1, each metal salt produces a different shade of red, ranging from yellowish to purplish blue. The different PR 49 types are thus mixed together to obtain a particular hue. The Ba and Ca types were and still are the most commonly found. The very dark purplish maroon colour of the Sr type was unfashionable in the 1950s and 1960s, and was rarely used alone; the Sr type was primarily used for adjusting the shade of the other types if a bluer tone was required. The pigment was used in its pure form when it was realised that the carrier contributed little to its application properties. The manufacture of lithol red today is identical to the process used in the 1950s, the only difference being improved control of the process. Better, computer-controlled equipment has ensured that batch-to-batch reproducibility is much improved, but though today’s ingredients may be more chemically pure than in the post-World War II period, the ingredients and process used are basically the same. The only manner in which lithol red has been significantly modified is via resination. This involves coating the pigment with an insoluble resin. The date when resination of pigments began is not clear, although it was certainly being carried out on lithol red by the early 1960s.19 Resinated pigments have better wetting properties, are more brilliant in colour, and show less tendency to bronze when used in print than resin-free grades.20 But perhaps the most important change brought about by resination is the increased transparency of the pigment; this is most important for printing applications, especially when ‘trapping’. ‘Trapping’ describes the laying down of small dots of transparent colour (red, yellow, and blue) to create coloured print: the more transparent the ink, the better the colour resolution in the trapped colours. When hiding power is required – for applications such as household or artists’ paint – non-resinated grades are employed. Lithol red is resinated via the introduction of sodium resinate (rosin dissolved in caustic soda) prior to making the pigment. When the pH is lowered, the resin precipitates onto the pigment surface. Resination slows the rate at which the pigment particles grow during manufacture, allowing the manufacturer to control the particle size. Resinated pigments therefore have a significantly smaller particle size than non-resinated grades. Two distinct types of the same pigment can thus be manufactured: one having large average particle size (non-resinated), and one having small average particle size (resinated). The small size of the resinated pigment results in huge surface area, which requires extra varnish for dispersion into ink. The net result is a large difference in ink body between non-resinated and resinated pigments when used in the same recipe.21 It also results in greater brilliance of colour, as the large surface area of the pigments enhances the colour. The degrees of resination can be tailored to specific needs. Below 5% is considered to be non-resinated; at 16 – 20% a point of diminishing returns is reached: no more brilliance or transparency is achieved. The degree of resination is thus an indicator of the transparency of the pigment. Nearly all pigments are surface treated by the manufacturer to improve their application properties. When lithol reds were first resinated, they yielded very short (stiff) ink bodies with linseed varnish, and were given a surface treatment to improve ink flow,22 probably with simple surface-active agents, also known as surfactants. The coating is usually applied by precipitation, but can also be adsorbed onto the surface. The amount of coating used is so small that it does not affect most of the pigment’s properties (e.g. colour strength, specific gravity etc.). In the 1950s the only lithol reds that were surface treated were those intended for the textile printing industry, where it was essential that the pigment wet out well in water: they were treated with simple wetting agents.23 Today, more sophisticated surface-active agents are employed if they are required. Pigments are sold on a colour strength basis. The pigment manufacturer will add extenders if he has a strong batch of pigment, as extenders are considerably cheaper than pigment. Clay is the most popular extender, and probably dominates today; barytes was also widely used. The amount of extender added depends entirely on the colour strength of the particular batch of pigment, and thus varies considerably. Although Wickline believes that base inks were supplied to the printing industry only,26 Larson reported that lithol red in the form of base ink was also supplied to paint and plastic manufacturers.27 Many finished inks could be made from the base ink, by blending it with extending inks, driers, solvents, varnishes and ink compounds. Larson also described ink manufacturers’ range of pre-mixed inks. These were a complete range of drying-oil based inks of high quality for both small and large printers. Most of these contained a dryer and were ready for printing in a range of systems.28 Indeed, the US company Flint Pigment Group were certainly well established in the manufacture of pre-mixed ink in the early 1960s. Importantly, these were available in small quantities, and could easily have been purchased by artists. In the 1950s and 1960s the primary binder for flushed colours and ready-made printing inks was linseed oil and pine rosin. Water-based inks often employed casein.29 Alkyds had just started to be used: primarily as an additive in linseed oil varnishes. Although alkyds were expensive, they had very good wetting and drying properties. Acrylics were not in use for printing inks at that time. Resins such as phenol-formaldehyde could also be used, but not to a great extent: different resins were chosen depending on the substrate that was to be printed on, and lithol red was thus used in a variety of different media. For a short while in the 1960s – it is not clear when this began – pigment manufacturers produced dyes and sold them to printing ink manufacturers.30 These did not replace pigment-based inks, but their purpose was to enhance the colour value of the pigment. They found use in the textile printing industry, and for dyeing substrates such as leather. Wickline describes them as a ‘fad’, and they died out quite quickly. However, it is possible that artists could have obtained these dyes. Owing to its brilliant colour and low cost, lithol red has been used for a variety of applications. The 1971 Colour Index describes its use in alkyd resin enamels and lacquers, linoleum, paper coating, emulsion paints, polyvinyl chloride, urea formaldehyde, phenol formaldehyde, polystyrene and amide-based plastics, and student grade artists’ materials.31 Herbst and Hunger, writing in 1997, also state that it was used for elastomers, and to a lesser extent for inexpensive industrial paints, and nitrocellulose paints.32 In 1996 Ash reported that it was used for paints and colouring plastics.33 Alphen states that in the mid to late 1960s lithol red was widely used in architectural paints and toy finishes.34 Surface Coatings also mentioned its use in toy finishes.35 Wickline confirmed that lithol red was used for a variety of applications until better, more durable alternatives were developed. However, all these authors agree that owing to its poor durability, its use in paint finishes was limited to inexpensive varieties. There is certainly clear evidence for the use of lithol red in artists’ paints: the entry into the 1971 Colour Index states that the Ba and Ca types were used for student grade artists’ colours, and Wickline confirmed that Flint supplied American artists’ colours manufacturers with the pigment when he joined the industry in 1962. According to Wickline, owing to its bright colour, lithol red was particularly popular for this application in 1940s and 1950s, a time when durability was perhaps not as high on the list of artists’ paint manufacturers’ priorities as it is today. Lithol red was undoubtedly widely available in the USA in the 1950s and 1960s, and it is evident that Rothko could have obtained it in a variety of forms: as a dry pigment, a water or oil-based paste, a ready-mixed printing ink, an inexpensive architectural or decorative paint, or as a ‘student grade’ artists’ paint. As the pigment is poorly dispersed in some areas of the Tate’s Seagram murals,36 it is likely that Rothko added it in the form of a dry pigment on at least some occasions (a paste or ready-mixed ink would comprise well-dispersed pigments). The fugitive nature of lithol red has also been discussed in relation to Rothko’s Harvard Murals.41 Taking into account the fact that Rothko took obvious care in his choices of colour, it is difficult to reconcile the idea that he would have anticipated and also accepted such a dramatic colour shift. Recent studies on the Tate’s Seagram murals have shown that the particular combination of Ba lithol red and ultramarine that he used exacerbates the fading of the lithol red:42 Rothko certainly could not have anticipated this synergistic effect. Rothko’s use of lithol red has had significant implications for the longevity and understanding of his artworks: the extremely high light levels suffered by the Harvard murals mean that they have faded to the degree that they are no longer considered suitable for display, whilst the fading of some of the Seagram murals – although much less dramatic – has altered the colour and tonal balance of the works, which must influence our interpretation and appreciation of them. It is only through the study of the history, properties, and behaviour of such materials that we can begin to understand how best to care for works of art that incorporate them, to admit the possibility that gross colour changes may occur, and to incorporate this into our understanding when there is good evidence that they have occurred. 1. M. Kimmelman, ‘Mark Rothko’s Harvard Murals Are Irreparably Faded by Sun’, New York Times, 8 August, 1988; M.B. Cohn ed., 1988 Mark Rothko’s Harvard Murals, Center for Conservation and Technical Studies, Harvard University Museums, Cambridge 1988; J.E.B. Breslin, Mark Rothko: A Biography, Chicago University Press, 1993. 2. See Leslie Carlyle, Jaap J. Boon, Mary Bustin and Patricia Smithen, ‘The Substance of Things’, in Rothko, exhibition catalogue, ed. Achim Borchardt-Hume, Tate, London, 2008. 4. Carlyle et al. p.84. 5. For a detailed discussion of Rothko’s working technique, and for analytical results see Carlyle et al, pp.75-87. 6. A.W.C. Harrison, The Manufacture of Lakes and Precipitated Pigments, London 1957, p.232. 7. W. Herbst and K. Hunger, Industrial Organic Pigments: Production, Properties, Applications, 2nd edition, Weinheim 1997, p.319. 8. Azo dyes and pigments are those containing a nitrogen group, particularly N=N. 9. H.J. Wolfe, Printing and Litho Inks, fourth edition, New York 1949, p.144. 10. A pigment is a coloured, insoluble solid that is dispersed in water, oil, or resin. A dye is a coloured soluble substance that imparts colour to a substrate by staining or chemical reaction. 11. Herbst and Hunger 1997, p.316. 12. Lithol reds work well in oil but hydrate in water where they become gelled and will not flow. The exception is the Ba salt, which is a very stable red in water. 13. C. Ellis, Printing Inks: Their Chemistry and Technology, New York 1940, p.163. 14. Colour Index, 3rd edition, Society of Dyers and Colourists, The American Association of Textile Chemists and Colourists, Bradford, North Carolina 1971, p.3307. 15. J. Bearn, The Chemistry of Paints, Pigments and Varnishes, London 1925, p.143. 16. E.E. Jaffe, ‘Pigments, Organic’, Kirk-Othmer Encyclopaedia of Chemical Technology, n.d., p.1. 17. ‘Flushing’ describes the process whereby aqueous pigment pulp is converted directly to pigment-in-oil dispersions. This is possible if the pigment is preferentially wetted by oil. 18. Rucker Wickline, ex-President, Flint Pigment Group, telephone interview with author, 10 October 2007. 20. Herbst and Hunger 1997, p.320. 21. L.M. Larson, Industrial Printing Inks, New York 1961, p.68. 24. G. Zerr and R. Rübencamp, A Treatise on Colour Manufacture: A Guide to the Preparation, Examination, and Application of All the Pigment Colours in Practical Use. London 1908, p.496. 32. Herbst and Hunger 1997, p.318. 33. I. and M. Ash, Handbook of Paint and Coating Raw Materials. Volume 1: Trade Name Products, Aldershot, 1996, p.402. 34. M. Alphen, ‘Paint Film Components’, National Environmental Health Forum Monographs, General Series No.2, 1998, p.137. 35. Surface Coatings Volume 1: Raw Materials and Their Usage, 2nd edition, prepared by the Oil and Colour Chemists’ Association, Australia, London 1974, p.335. 36. See Carlyle et al. 2008 and the exhibition pages. 37. Max Doerner, The Materials of the Artist, New York, 1934, p.92; 1949, p.92. 38. Ralph Mayer, The Artist’s Handbook of Materials and Techniques, London 1951, p.51. 40. R. J. Gettens and G. L. Stout, Painting Materials: A Short Encyclopaedia, London, 1942, reprinted 1966, p.124–5. 42. Carlyle et al 2008, p.84. 43. Carlyle et al 2008, p.78. My thanks to Rucker Wickline (ex-President of Flint Pigment Group, USA), Joyce Townsend (Tate), Leslie Carlyle (Tate), Mary Bustin (Tate), and Patricia Smithen (Tate) for their help and advice in preparing this paper. Dr Harriet Standeven is a Tutor on the Royal College of Art/V&A Museum Conservation programme, London, and also works as a freelance paintings conservator. Harriet A. L. Standeven, ‘The History and Manufacture of Lithol Red, a Pigment Used by Mark Rothko in his Seagram and Harvard Murals of the 1950s and 1960s’, in Tate Papers, no.10, Autumn 2008, https://www.tate.org.uk/research/publications/tate-papers/10/history-and-manufacture-of-lithol-red-pigment-used-by-mark-rothko-in-seagram-and-harvard-murals-1950s-and-1960s, accessed 20 April 2019.